The flowers may be in full bloom, the birds chirping and the temperatures rising, but does your home still feel like it is stuck with the winter blues? With Spring here, now is the time to grab your duster, roll up your sleeves and freshen your house. 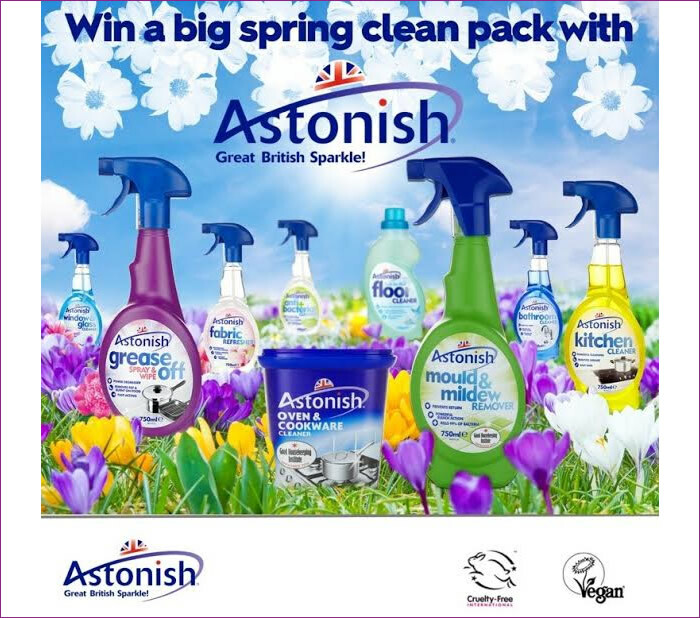 And to help make the Spring clean easier, Astonish, has pulled together a cleaning pack featuring all you need to leave your home looking as bright as the sunshine and smelling as fresh as blossoming daffodils. So, what are you waiting for? Enter the giveaway now and you could be the lucky one to walk away with this prize bundle. Included in the pack is Astonish's Window and Glass Cleaner that will help the Spring sun to shine through your windows, the Fabric Refresher to banish smelly odours and leave your home with a fresh scent and the Fresh Sea Mist Floor Cleaner to help get your kitchen and bathroom floors squeaky clean. With this handy cleaning pack, you’ll be able to make light work of the big Spring clean and achieve a home that is spotless for the new season. - Multi Surface Cleaner with Orange Oil.